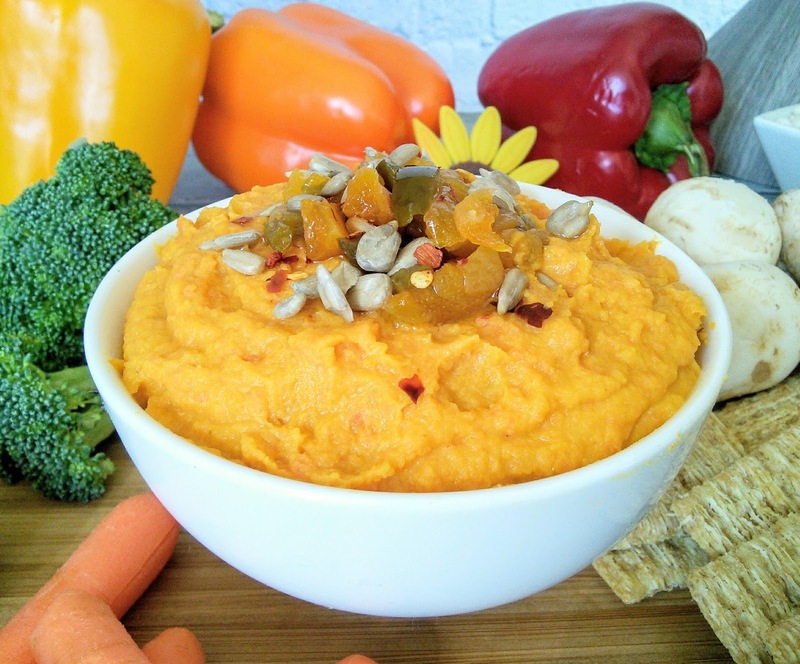 This Spicy Carrot Hummus is filled with tangy sweetness and topped with sunflower seeds and apricots — with just the right amount of heat. I love hummus as it is such a healthy spread that tastes great with veggies, crackers, and by the spoonful. I discovered carrot hummus when I attended a conference and it was love at first bite. I was so happy that my local health food store carried this delicious hummus and it quickly became my favorite healthy splurge/snack that I treated myself to every week. The only problem was the cost. I hated spending 6.00 on a small container of hummus that I usually ate in one day. So I decided to see if I could make this tasty hummus myself. I looked at the ingredients on the store bought hummus and made a couple of ingredient changes-like crushed red pepper for sriracha sauce. I am happy with my homemade spicy carrot hummus and for the fact that it makes a large serving, more than twice the size of the store-bought hummus. Now I can eat more of this yummy hummus, more often. So grab the carrots and make this delicious healthy hummus! 1.Preheat the oven to 400F. Place the carrots in a bowl with the 1 tablespoon olive oil and stir to coat them well. Place the carrots on a baking sheet and bake for 30-40 minutes or until tender. 2. Allow the carrots to cool and then place them in a food processor with the remaining ingredients. Blend until smooth, about 2 minutes. 3. Place the hummus in a bowl and then make the topping. 4. Combine the dried apricots, jalapenos, and olive oil together and then place on top of the hummus. Sprinkle the sunflower seeds over the topping. Want more hummus recipes? Check out these other delicious hummus recipes. Looks delicious and this one is getting bookmarked! Can you make this with other vegetables as well? I don't like carrot, it's the only vegetable I don't eat. I love hummus and love the fact you have made it even healthier. Thank you for all the different hummus recipes too. This is so colorful and looks so tasty. I love humus for chips and dips. A must have for any gathering or family get together. Oh yum! 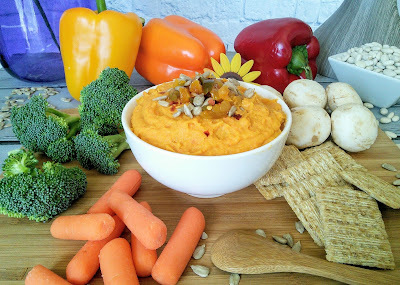 I love the idea of a spicy carrot hummus. The spice and the sweet from the carrots would make for an amazing flavour! Hummus is one of my fave snacks. I am going to try this recipe because I totally love that it incorporates carrots. I am willing to bet the layers of flavour are amazing. That is an awesome snack idea. Hummus is one of my favorites to make. In our house, hummus is a staple. I usually buy it over the counter and I love mine spicy. I will have try to and make this because it look so good, and the flavor combination seem delicious. This is great, i've never made my own hummus but after reading this i'm willing to have a go, t looks so yummy. 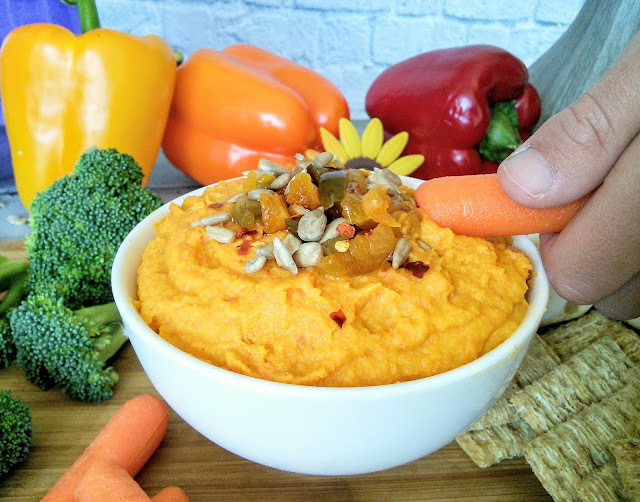 The spicy carrot hummus looks delicious on its own, but I love the idea of topping it with pickled jalapenos and apricots. IT looks amazing! I am going to make this next week. This looks delicious! I have not really had hummus yet--I know I may be one of the only few left in the world:0 I love carrots though so I should check it out. I have never thought of carrots and spicy together! Interesting. I have had all sorts of hummus before but have never had carrot. This sounds like it would be so delicious and healthy at the same time. This sounds awesome, I love hummus and make it all the time, also spicy, but I have never had carrot hummus. This would be something new to try. I always thought hummus can only be made of chickpeas. This recipe is awesome! I'm pinning it! never tried it but it looks delicious, well done !